APA EWS trademarked glued laminated timber (glulam) must be stored properly and handled with care to assure optimum performance. Adhering to the producer's recommendations or the following guidelines will help protect glulam from damage in storage, during shipment and on the job site. When glulam beams leave the mill, they are often protected with sealants, primers or wrappings that are specified in the order. Care must be taken during loading, unloading and transporting as well as in the yard and on the job site to protect the members from damage. Loading and Unloading. 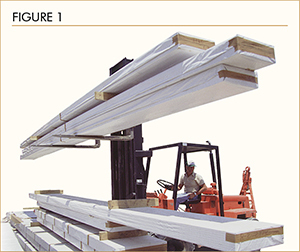 Glulam beams are commonly loaded and unloaded with fork lifts. For greater stability and handling safety, place the sides of the beams, rather than the bottoms, flat on the forks (see Figure 1). Carrying extremely long beams on their sides, however, can cause them to flex excessively. To control flex in these cases, use two or more fork lifts, lifting in unison. If a crane with slings or chokers is used to load or unload beams, provide adequate blocking at all beam edges between the sling and the members to protect corners and edges. Only fabric slings should be used to lift glulam members. Using spreader bars can reduce the likelihood of damage when lifting long beams. Follow established material handling safety standards in all lifting and moving operations. Storage in the Yard. A level, well-drained covered storage site is recommended. 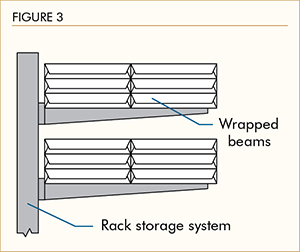 Keep beams off the ground using lumber blockings, skids or rack systems, as shown in Figures 2 and 3. If the beams are wrapped, the wrapping should be left in place to protect them from moisture, soiling, sunlight and scratches. For long-term storage, cut slits in the bottom of the wrapping to allow ventilation and drainage of any entrapped moisture (see Figure 2). Proper ventilation and drainage will reduce the likelihood of water damage. Center beams on blockings or racks with the load evenly distributed as shown in Figure 2. Transportation. Stack beams on lumber blocking or skids when loading them on rail cars or trucks. Beams can rest on their sides or bottoms. Secure the load with straps to keep it from shifting. Protect beam edges with "softeners" or wood blocking when strapping down the load. Storage at the Job Site. If possible, store glulam under cover to protect the beams from moisture, soiling and sunlight. Place the beams on spaced lumber blocking on level, well-drained ground. In many instances, the wrappings can be left intact to protect beams until installation. Seal ends of beams whenever possible after trimming or cutting. Once beams are installed, allow them to gradually season and adjust to the temperature and moisture conditions of the structure. Do not expose glulam members to rapid changes in moisture and temperature, such as may occur from temporary heating units. Such exposure may result in excessive surface checking. See Owner's Guide to Understanding Checks in Glued Laminated Timbers, Form F450 and APA Technical Note: Evaluation of Check Size in Glued Laminated Timber Beams, Form R475, for additional information on checking in glued laminated timber. Sealants, Primers and Wrappings. Sealants applied to the ends of beams help guard against moisture-penetration and excessive end grain checking. 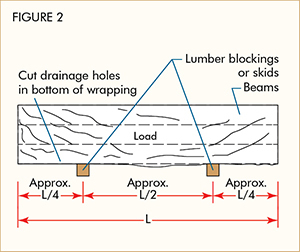 A coat of sealant should be field applied to the ends of beams (see Figure 4) if they are trimmed to length, dapped or otherwise cut after leaving the mill. See APA Technical Note: Field Notching and Drilling of Glued Laminated Timber Beams, Form S560, for additional information on field cutting of glued laminated timber. Surface sealants, which can be applied to the top, bottom and sides of beams, resist dirt and moisture intrusion and help control checking and grain raising. 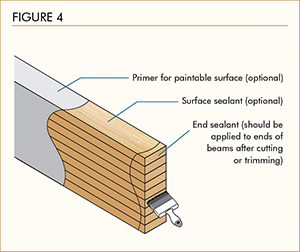 Specify a paintable penetrating sealant if beams are to be stained or given a natural finish. A primer coat also helps protect beams from moisture and soiling and provides a paintable surface for subsequent finishing, if specified. Water-resistant wrappings are often specified to protect beams from moisture, soiling, and surface scratches during transit and job site storage. Because exposure to sunlight can discolor beams, opaque wrappings are recommended. Beams can be wrapped individually, by bundle or by load tarping. In applications where appearance is especially important, individual wrapping should be left intact until installation to minimize exposure to job site conditions. Disclaimer: The information contained herein is based on APA – The Engineered Wood Association's continuing programs of laboratory testing, product research, and comprehensive field experience. Neither APA, nor its members make any warranty, expressed or implied, or assume any legal liability or responsibility for the use, application of, and/or reference to opinions, findings, conclusions, or recommendations included in this publication. Consult your local jurisdiction or design professional to assure compliance with code, construction and performance requirements. Because APA has no control over quality of workmanship or the conditions under which engineered wood products are used, it cannot accept responsibility for product performance or designs as actually constructed. © 2014 APA – The Engineered Wood Association. All Rights Reserved.